Traditionally, the only way to obtain an expansion's special redeemable in-game vanity pet was to purchase and attach a Collector's Edition copy to your Battle.net account. However, MoP will be the first expansion in which there will be an alternative to buying the physical copy of the CE. Blizzard is offering a Digital Deluxe Edition of MoP for $59.99 USD. For more information, check out the official Digital Deluxe Edition page. 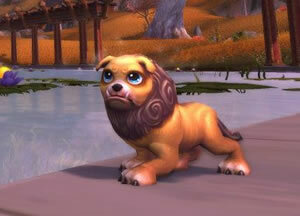 In addition to being able to pre-download the new content and play the moment MoP launches, this version of the expansion will also come with the Collector's Edition companion, the Lucky Quilen Cub (pictured below), and a new mount. Players may still purchase the physical box copy of the Collector's Edition from retail locations for $79.99 USD. Only a limited number of copies will be available, so inquire at your local game store for more information. This version of the game will also come with the redeemable companion pet and mount, as well as many other gifts. Players can purchase the standard version of the expansion now, but can upgrade to the Digital Deluxe Edition for an additional $20 later. So if you start your travels through Pandaria and find that it feels a little lonely, you can always claim your very own Lucky Quilen Cub at a later date! Can't wait until September 25 to get your first taste of Pandaria and all the wonders of MoP? Each Tuesday over the next five weeks, Blizzard will randomly select 2,000 winners to receive a MoP beta key, and every other winner will also receive a second key for a friend. To enter, just follow Warcraft on Facebook and then complete the entry form. Players have from now until August 27 to enter for a chance to win. For more information, check out the rules and eligibility page or the FAQ.